The Bogey Hole Cafe is a delightful little cafe set in Bronte Beach. Popular with the locals, and the menu is a great smattering of café fare with both breakfast and lunch options. Those looking for meat-based options will not be disappointed with the Crispy Skin Chicken ($21), which comes with a salad of cauliflower, chickpea, almond and quinoa - together with a jalapeno lime dressing. 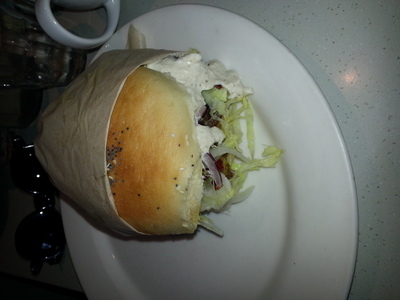 There are also two sandwich options: Stir Fried Chicken Sandwich served with Hot Piri Piri Sauce ($13), and the Slow Roasted Pork Belly Sandwich with Jalapeno Relish and Hoi Sin on Turkish bread ($15). It is the mix of flavours and interesting combinations that makes the dishes on this menu worth trying. The décor of the Bogey Hole is reminiscent of the beautiful beach it faces. The colours of grey, and a muted blue running throughout the café are calming. With the added colourful paintings of the local surrounds hanging on the walls, and a beautiful old tinned ceiling - The Bogey Hole Café exhibits a lot of charm. If the weather permits, an outdoor table along the footpath among the bustle of the other nearby cafes is a great way to spend the meal. Otherwise, a seat by the windows to watch the ocean is a perfect setting to enjoy the yummy creations coming out of the kitchen. The Bogey Hole Burger ($13) consists of a curried lentil burger with beetroot, alfalfa, avocado and cucumber. This filling and tasty dish had just enough sweet chilli and tahini dressing to compliment the curry flavour. This burger didn’t need any hot chips or side salads to accompany it. It was perfect on its own. 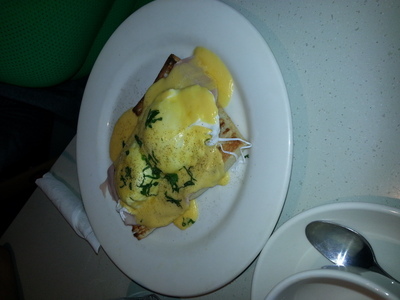 Other members at the table raved about the Eggs Benedict ($17), which was also generously portioned with a choice of either bacon, ham or smoked salmon. 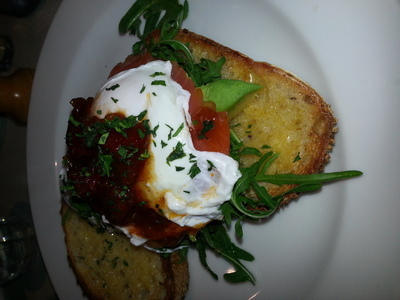 The Poached Eggs and Chilli Jam Stack was a real stand out with ham, rocket, avocado and ricotta, and all on a grain sourdough. And the server was obliging enough to substitute the ham for smoked salmon in the stack - although it should be noted that this type of request will not be observed during busy weekend hours. Yummy fresh juices - such as carrot, orange and ginger; as well as milkshakes, tea and coffee are all on offer as at most other cafes, yet the Cappuccino and the Bancha Tea were standouts. So yummy was this meal, it was decided that a take away tea ($3.50) and an ANZAC biscuit were the perfect way to stroll up the beach and away from The Bogey Hole Café. Why: For the Bogey Hole Burger, and for the beautiful ambience and backdrops. Cost: Around $15-$22 per dish excluding coffee, tea or juice. When: Open 7 Days a week, 7am - 4pm. Weekends will be busy though, unless you get there before the 10am rush. Good for kids: Yes, although it is a small space. Therefore there is not much room to be rowdy. The beach is just a stone's throw away.